The latest official death toll stands at 31. Up to 230 people are reported to have been injured. The 'Isis chief bomb maker' and Airport attacker is still on the run. Two brothers named as suspects involved in the bombings bombings. One of the suspects from the CCTV image (on the right) was not identified by the prosecutor. However, Belgian media has named him as Najim Laachraoui – known as the ‘chief Isis bombmaker’ and had linked to the Paris attacks. He is still on the run. Earlier reports of his apparent arrest were incorrect. He did not detonate his bomb, which the prosecutor said was the biggest of the three bombs. The prosecutor confirmed Ibrahim el-Bakraoui was responsible for the first explosion at the airport. The second airport suicide bomber has not been identified. Khalid el-Bakraoui, has been identified as the bomber responsible for the underground attack at Maelbeek – killing at least 20 people. The Metro explosion took place in the second carriage of the train while it was still at the station, he added. He said 32 people were confirmed dead in the attacks and a further 270 injured. This, however, is likely to change. Belgium's federal prosecutor confirmed that two brothers carried out suicide attacks at Brussels airport and on a metro train that killed 31 people and wounded 270. Ibrahim El Bakraoui blew himself up in the check-in hall of Zaventem airport while Khalid El Bakraoui attacked a metro train at Maalbeek station near the EU headquarters, Frederic van Leeuw told a news conference. Belgian Federal Prosecutor is holding a live press conference. He confirms that one man is still on the run, though he didn't identify him. He also said he was carrying the most destructive bomb - which didn't detonate. Brussels Airport has said there will be no passenger flights tomorrow. They are looking at the possibilities to start cargo flights today or tomorrow. "Passengers who have cars at the airport parking can’t retrieve their car yet. Brussels Airport will communicate as soon as possible about any changes." "Arrested man in Anderlecht is not Najim Laachraoui," the Derniere Heure newspaper tweeted, while the RTL broadcaster said that the "suspect arrested in Anderlecht was not Najim Laachraoui in the end." The IndependentThere are conflicting reports over whether a suspected Isis bomb maker believed to be behind the terror attacks that killed more than 30 people in Brussels has been arrested. There are conflicting reports regarding the arrest of Laachraoui. Belgian media are rowing back on earlier claims. Press Association are reporting Brussels bomb suspect Najim Laachraoui is still on the run. Police and prosecutors have been declining all comment but will hold a news conference at noon GMT. The woman photographed in the Brussels Airport attack yesterday morning has been identified as crew member of India-based airline Jet Airways, Sky News are reporting. Nidhi Chaphekar was photographed with her face covered in blood and her uniform shredded following the attack that left at least 11 people dead and scores injured. A minute of silence has just been held in Belgium in memory of the victims of yesterday's attacks. 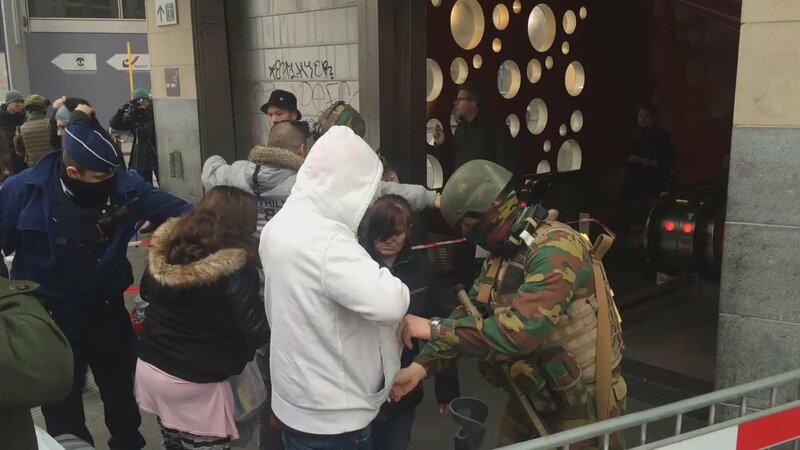 New, and still unconfirmed, reports are emerging from Belgium that Najim Laachraoui was arrested in a pizzeria. Bizarrely, pizza has cropped up again and again in the course of the Paris attacks investigation. Takeaway pizza reportedly helped lead police to Salah Abdeslam's hideout last week while empty pizza boxes were also found in hotel rooms where the Paris attackers prepared for their massacres. The IndependentThe suspected Isis bomb maker believed to be behind the terror attacks that killed more than 30 people in Brussels has reportedly been arrested in a pizzeria. The Prime Minister has asked all government departments to observe a minute's silence at 11am in a mark of respect following the attacks. “We are concerned about one missing British national and we are in close contact with the Belgian authorities. We are aware of four British nationals who were injured in the attacks - three are being treated in hospital, one has already been discharged. Our embassy staff are working to assist all British nationals affected. “In terms of travel advice, we continue to advise people to follow the advice of the Belgian authorities. Therefore we are no longer advising against travel to Brussels. British nationals in Belgium should remain alert and vigilant, stay away from crowded places, and follow the instructions of the Belgian authorities. “Here in the UK, we stepped up the security presence at a number of locations across the country yesterday and we will maintain this in the coming days. The national threat level remains at SEVERE (an attack is highly likely) and the public are advised to be ‘alert but not alarmed’. Downing Street today said it was concerned about one missing British national following the Brussels terror attacks, adding that four Britons had been injured, three of whom are in hospital. Newspaper La Derniere Heure reported: "The third man in the images taken at Brussels airport was arrested this morning by the DSU (Belgian Federal Police's Counter Terrorism and Swat Unit), according to our sources. "The federal prosecutor has not confirmed this information." The IndependentThe suspected Isis bomb maker believed to be behind the terror attacks that killed more than 30 people in Brussels has been arrested in Belgium, a newspaper has reported. La Derniere Heure quoted anonymous police sources saying that Najim Laachraoui had been detained in the city of Anderlecht on Wednesday morning. Brussels bomb supsect Najim Laachraoui has been arrested in Brussels, according the Belgian media. The IndependentBelgian media has named two suicide bombers involved in the attacks in Brussels as brothers Khalid and Ibrahim, also known as Brahim, el-Bakraoui. Another man, who was pictured at the airport on CCTV, has been named as Najim Laachraoui by Belgian newspaper La Dernier Heure. On Tuesday morning, there were two explosions at the airport. Shortly after, there was a third explosion at Maalbeek Metro Station. Belgian media has named two suicide bombers involved in the attacks in Brussels as brothers Khalid and Ibrahim, also known as Brahim, el-Bakraoui. 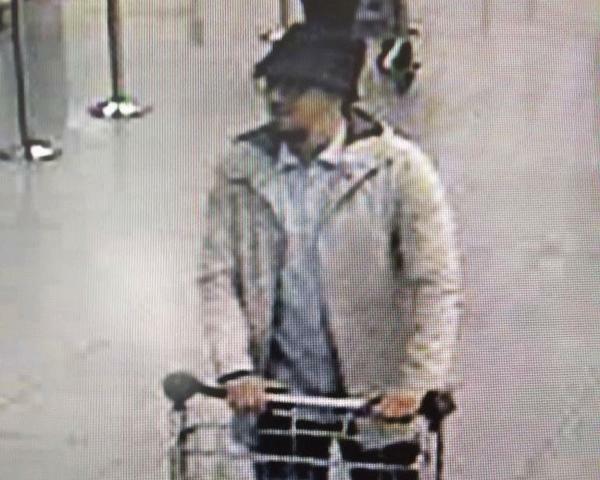 Another man, who was pictured at the airport on CCTV, has been named as Najim Laachraoui by Belgian newspaper La Dernier Heure. On Tuesday morning, there were two explosions at the airport. Shortly after, there was a third explosion at Maalbeek Metro Station. Welcome to the second day of our live coverage of the Brussels terror attacks. The latest official death toll stands at 31. Up to 230 people are reported to have been injured. Raids were carried out on Tuesday night and police circulated a CCTV image of three men seen at Brussels Airport. Three days of national mourning has begun. There will be a minute’s silence for the victims at midday local time. Australian Prime Minister Malcolm Turnbull blamed Europe’s borders and lax security for the attack. He assured his people that Australia’s “security arrangements are much stronger than they are in Europe where regrettable they allowed things to slip”. Brussels has been on the highest level of terror alert since November's Paris attacks and has seen several operations in recent weeks linked to the hunt for Salah Abdeslam, who was caught on Friday. The identities of some of the victims of Tuesday’s bomb attacks in Brussels have come to light, with a Peruvian woman, Adelma Tapia Ruiz, the first to be publicly confirmed dead. A British man, David Dixon, is among the people known to be missing from the Belgian capital one day after the blasts at Zaventem airport and Maelbeek metro station killed more than 30 and injured an estimated 230 people. A Moroccan woman has also been formally identified as a victim of the metro station attack by Moroccan diplomatic sources, according to Belgian media.